Washington, DC, September 11, 2018 --(PR.com)-- Cecelia E. Ford of Washington, D.C. has been honored as a VIP for 2018 by P.O.W.E.R. (Professional Organization of Women of Excellence Recognized) for her outstanding contributions and achievements for over 40 years in the field of physical education. These important women exemplify tenacity. They realize that in order to reach their goals, they must never give up and continue to strive to become influential in their profession. Cecelia Ford retired as a Health and Physical Education Teacher after 40 years. Born and raised in Washington, D.C., she was always called a “Tomboy” because of her love for “non-feminine athletics,” as it was referred to years ago. She was voted “Most Athletic Female” in her high school. Loving sports and athletics was her calling to be a teacher. She obtained a B.S. in Health and Physical Education from DC Teacher’s College in 1973, where she was the only female on the Varsity Baseball Team. She completed graduate courses at Trinity College in Washington, D.C. in the 1980’s and at the University of Maryland in the 1990’s. Cecelia taught in the DCPS System for over 30 years and spent 7 years teaching in the PGCPS system. Due to the under-privileged nature of the DCPS, she learned to “use what you got” with respect to the equipment-depraved System. She taught in hallways for years, never missing a beat. Cecelia taught the basics of folk and square dance to her students who displayed their dances at the annual May Day Programs which included wrapping a May Pole which she would make from discarded carpet spools and sheets with school colors. When they finally had a full-sized gym in the elementary-level schools, she sponsored up to 20 after-school athletic/health clubs, culminating in an Awards Banquet at years end where she created trophies, plaques and certificates for the students. The Health Club had student nurses from Howard University work with the students to prepare them for an annual Health Fair where the students would use blood pressure cuffs, stethoscopes, vision machines, wall charts and second-hand stop watches to for pulse rates. The University of the District of Columbia sent their Physical Education Majors to Ms. Ford for mentoring. She also served as Coach for several sports, as a Summer Program Director and was an Instructor for Calligraphy, Gymnastics, Aerobics and other activities. Ms. Ford also worked part-time for 8 years as a Realtor with Ekuban & Associates, which was one of the only black broker companies at the time. Cecelia is the Founder and President of the League of Women Bowlers which she started to promote the sport of bowling for women. She organizes social events, competitions and activities. Cecelia has been awarded the Bronze Medal in the 2006 Gay Games/Olympics and a Gold, Silver and Bronze Medal in bowling competitions at the Gay Games/Olympics in 2014. She has received trophies and recognitions for pioneering community women’s social activities in the DMV area by the local and international gay bowling organizations, including the GLBT Pioneer Award for community service in women’s athletics. 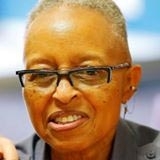 She was Chairperson from 2208-2014 for the International Gay Bowling Organization Women’s Outreach Committee. She also served as Committee Person on the Board of the local DC Sports Organizations (Team DC) and CARA (Capital Area Rainbowlers Association). She was honored with the Roger B. Newman Recognition Award from CARA in 2013 and her team with the CARA League Champions for three years. She is affiliated with Delta Sigma Theta Sorority. As a retiree, Cecelia concentrates on her love of archery, bowling, photography, riding her bicycle and coloring. She also cares for her 96 year old mother. She credits her father, George Henry Ford, as the person who most influenced her life and career. Cecelia’s future goals are to publish a novel about her life as a lesbian in her profession, to continue to encourage self-acceptance and assurance in women and make a difference in women’s athletics and sports achievement recognition.